Again this morning, some areas are experiencing thick fog and low clouds. As was the case Tuesday this will need to dissipate before the sun takes over, but it will and temperatures will also respond. There’s a cold front slicing through the middle of the country this morning and behind, the end of our summer weather. You can see the line of clouds, which has been color enhanced, moving east on the morning satellite. The past several days have been pretty amazing for the final week of September. Temperatures yesterday again reached high into the 80s, far above average. Along the coast, sea breezes have kept it much less hot, but even there it’s been summer-like this week. Today will be quite warm again with lots of 80s an even a few 90-degree readings possible in the foothills away from the effects of the ocean. It will be cooler at the coast, but not cool. This is a typical summer day, it’s just occurring at the end of September. This morning, some areas are experiencing thick fog and low clouds. As was the case Tuesday these will dissipate, the sun will take over and temperatures will respond. In addition to the warm weather we also have summertime humidity levels. If you are working outside today, remember to stay hydrated. This isn’t dangerous heat by any means, but it’s quite anomalous. 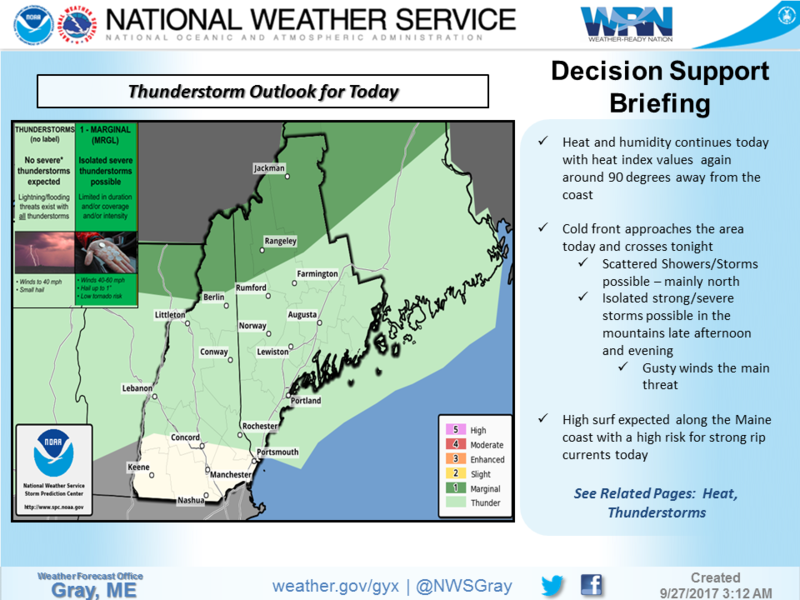 There is a chance of a shower or thunderstorm later today in the tropical air mass. The risk is quite low, but it’s not zero. The highest chance of storms will be in the mountains where the additional lift from the hills will help force the air up and might initiate precipitation. The cold front to our west will work east overnight and pass off the coast Thursday. Since the front will come through early in the morning, it will take a few hours for the drier air to arrive. 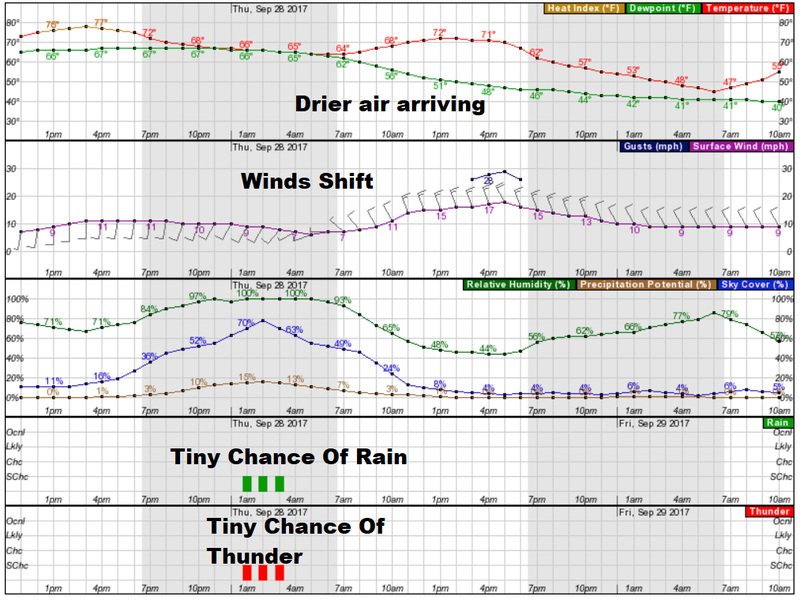 The chart below shows when the lower dew points are expected. Notice the rapid fall tomorrow morning. This means although it will be muggy early, it will feel much more comfortable by lunchtime and Friday morning will finally actually feel like late September. Our weekend weather looks seasonably mild and dry. I don’t see any signficant rainfall in sight and if you have started a lawn this fall be sure to actively keep it watered as Mother Nature won’t be helping you anytime soon.